What’s more important than just having a diverse community, however, is being a community where people feel supported and welcomed – a community where each one of us can thrive, and where our differences are respected and embraced. Attending this conference, whether you’ve traveled to get here or simply walked across campus, is an investment of your valuable time and resources. The Organizing Committee and the Centre for Teaching and Learning are committed to providing a safe, respectful, and productive environment so you can fully engage in learning with your peers and colleagues. 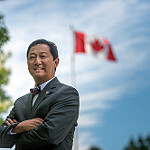 Excellence in learning, research and work in the university community is fostered by promoting the freest possible exchange of information, ideas, beliefs and opinions in diverse forms, and it necessarily includes dissemination and discussion of controversial topics and unpopular points of view. Respect for the value of freedom of expression and promotion of free inquiry are central to the University’s mission. However, these freedoms cannot exist without an equally vigorous commitment to recognition of and respect for the freedoms of others, and concern for the well-being of every member of the university community. Excellence in scholarship, teaching and employment activities flows from active concern and respect for others, including their ability to participate meaningfully in the exchange of information, ideas, beliefs and opinions. If there’s an immediate threat to your safety, contact Campus Security at 250-807-8111. Speak with someone at the Conference Registration Desk in the Commons Galleria. If you have experienced a sexual assault, sexual harassment, or any other form of sexual violence or misconduct, contact Shilo St. Cyr, Director of the UBC Okanagan Sexual Violence Prevention and Response Office at 250-575-8586 or shilo.stcyr@ubc.ca.The SVPRO is a single point of contact and liaison for UBC students, faculty, and staff and can provide confidential personal support, facilitate referrals to campus and community resources, and identify and coordinate appropriate accommodations.The SVPRO can also provide information on reporting options and support through the reporting process. If you are supporting a survivor, the SVPRO can provide information and support to you in this role. Do Studies of Active Learning in Post-Secondary Science Education Reveal Gendered Effect on Student Outcomes?